PESHAWAR: An explosion was heard during a rally of Awami National Party (ANP) in Peshawar on Tuesday with reports suggesting party’s candidate Haroon Bilour was critically injured. Initial reports suggest the explosion occurred near the vehicle of Bilour, son of late ANP leader Bashir Bilour, in the Yakatoot area. The nature of the blast is being confirmed. The injured persons are being shifted to the Lady Reading hospital. PESHAWAR: At least four people have been killed and multiple others wounded in a blast at a corner meeting of Awami National Party (ANP) in Peshawar on Tuesday, according to police. The explosion took place in Yaka Toot area of the provincial capital, where the corner meeting was underway. It occurred as the ANP leader, Haroon Bilour, arrived at the stage to address supporters. He is contesting the election from PK-78 Peshawar. Haroon is son of Bashir Ahmed Bilour, a senior ANP figure who was himself martyred in a suicide blast in Peshawar in 2012. According to police sources, Haroon was also among the wounded persons. At least six wounded persons were said to be in critical condition at Peshawar's Lady Reading Hospital. PESHAWAR: At least four people have been martyred and multiple others wounded in a blast at a corner meeting of Awami National Party (ANP) in Peshawar on Tuesday, according to police. The National Counter Terrorism Authority (NACTA) has informed a Senate panel that major political leaders, including Pakistan Tehreek-i-Insaf Chairman Imran Khan, are facing threats to their lives from terrorists amid electioneering. Nacta director Obaid Farooq while briefing the Senate Standing Committee on Interior on Monday about the possible terror attempts during the election season of Pakistan said that six key politicians, including Imran Khan, Awami National Party (ANP) leaders Asfandyar Wali and Ameer Haider Hoti, Qaumi Watan Party (QWP) head Aftab Sherpao, Jamiat Ulema-i-Islam-Fazl leader Akram Khan Dur*rani and Hafiz Saeed’s son Talha Saeed are under threat. He added that there are also threats to the top leadership of Pakistan Muslim League-Nawaz (PML-N) and Pakistan Peoples Party (PPP). I hear that his son is also critically injured. Hope he recovers soon. I have known him and his family personally. A very brave and dedicated young man. Peshawar has lost yet another asset, and yet again ANP has been targeted. The military have a lot to answer - this is the result of the billions that have been spent. Intel Chief and Corp Commander need to go home. No party has suffered more at the hands of terrorism than ANP, yet they remain resolute in their pursuit. This tragedy might change their fortunes in the elections, but they have lost a great leader. What a sad, sad day for the city, but unfortunately, this will be swept under the carpet just like his father's death in 2012. Last edited by Abdullah719; 11th July 2018 at 04:18. Haroon Bilour s/o Bashir Bilour... Brave son of a Brave father... Martyred son of a Martyred father. What a tragedy for Bilour Family. Heart bleeds for them & other victims. May Allah give them strength. At least 12 persons including Awami National Party (ANP) leader Haroon Bilour were killed in a suspected suicide blast which targeted an election gathering of ANP in Yakatoot area of Peshawar on Tuesday night, a senior police official said. Peshawar Capital City Police Officer (CCPO) Qazi Jameel said that more than 30 people were injured in the explosion, who have been shifted to Lady Reading Hospital. The blast took place when Haroon Bilour, who was contesting elections from PK-78 constituency, arrived at the site where the ANP workers had gathered for a corner meeting. Bilour suffered serious injuries and was shifted to the hospital where he succumbed to his wounds. “According to our initial investigation, it was a suicide attack and Haroon Bilour... was the target,” said AIG Shafqat Malik. The rescue teams and law enforcement agencies reached the site of the blast. Police and bomb disposal officials collected evidence from the site of the blast and initiated an investigation into the incident. The body of Haroon Bilour was later shifted to Bilour House where ANP workers gathered in great numbers to pay respect to their deceased leader. ANP leader Iftikhar Hussain said the funeral prayers of Haroon Bilour will be offered on Wednesday at 5pm at Wazir Bagh in Peshawar. Haroon Bilour was the son of senior ANP leader Bashir Ahmed Bilour who was killed when a Pakistani Taliban bomber blew himself up in a party meeting in Peshawar in 2012. The following year in 2013, the Tehreek-i-Taliban Pakistan (TTP) had claimed responsibility for an attack at an ANP rally in Peshawar, in which 15 people were killed. The TTP spokesperson at the time, Ehsanullah Ehsan, had told journalists that Haroon was the target, but "unfortunately Ghulam Ahmed Bilour got injured". The ANP, which governed the Khyber Pakhtunkhwa province from 2008 to 2013, has been a continual target of militant groups operating in the northwest. The militants killed hundreds of ANP leaders and supporters in attacks around the 2013 election. Earlier this month, seven people including a candidate of the Muttahida Majlis-i-Amal were injured in an explosion during an election rally near Takhtikhel canal. The Taliban have time and again threatened to target secular parties for what they call supporting the military action in tribal areas and the “war on terror”. Although there has been no immediate claim of responsibility for the attack, the city of Peshawar has for decades been a victim of militancy due to its status as a frontline for the ongoing war against terrorism as well as its proximity to the restless tribal areas and the Pak-Afghan border. The Natio*nal Counter Terrorism Authority (Nacta) on Monday had revealed the names of six personalities, including Imran Khan and Hafiz Saeed’s son, who could be targeted by terrorists during the ongoing election campaign. “Six people include Pak*istan Tehreek-i-Insaf chairman Imran Khan, Awami National Party leaders Asfandyar Wali and Ameer Haider Hoti, Qaumi Watan Party head Aftab Sherpao, Jamiat Ulema-i-Islam-Fazl leader Akram Khan Dur*rani and Hafiz Saeed’s son Talha Saeed. Moreover, there are threats to senior leadership of the Pakistan Peoples Party and Pakistan Muslim League-Nawaz,” Nacta director Obaid Farooq said while briefing the Senate Standing Committee on Interior. RIP Mr Bilour and all others! So sad how their family keeps getting attacked again and again. Also sad to see the violence starting after reasonably peaceful campaign so far. May all the wounded get Shifa and the perpetrators rot in hell.Ameen. Sad to hear about the death of ANP worker Haroon Bilor and other the members. May Allah give patience to their families. Wishing speedy recovery to the injured. Why do these terrorists keep on attacking ANP and in particular Bilours? The banned Tehreek-i-Taliban Pakistan (TTP) on Wednesday claimed responsibility for the Peshawar suicide blast that killed senior Awami National Party (ANP) leader Haroon Bilour and 19 others last night. Bilour, whose father Bashir Bilour was also killed in a TTP-claimed suicide attack in 2012, was targeted on Tuesday night at an election gathering in the Yakatoot area. He was contesting the election from the PK-78 constituency. The blast took place when Bilour arrived at the site of a corner meeting. He suffered serious injuries and was shifted to Lady Reading Hospital (LRH) where he succumbed to his wounds. Rescue teams and law enforcement agencies rushed to site after the blast. Police and bomb disposal officials collected evidence from the blast site and initiated an investigation into the incident. “According to our initial investigation, it was a suicide attack and Haroon Bilour... was the target,” said Additional Inspector General Shafqat Malik. He said that an initial probe suggested that a young boy blew himself up at the main entrance of the gathering when Bilour entered the venue. The death toll was initially reported to be 13, but it rose to 20 overnight, according to Lady Reading Hospital Spokesperson Zulfiqar Ali Baba Khel. Scores of people suffered injuries as a result of the blast. The LRH spokesperson told media that 48 injured were discharged from the hospital after initial treatment, while 15 people including a minor girl were still being treated. The spokesperson added that the girl and five others were in a critical condition. Meanwhile, police arrested a suspect from the hospital. The suspect was among the wounded who were shifted to the hospital by rescuers, police sources said. The body of Haroon Bilour was later shifted to Bilour House where ANP workers gathered in large numbers to pay respect to their deceased leader. Peshawar Capital City Police Officer (CCPO) Qazi Jameel said that the provincial police chief has constituted a five-member Joint Investigation Team (JIT) to probe into the incident. The team has been tasked to submit its report within a week. The deputy inspector general of the Counter-Terrorism Department is heading the JIT. A First Information Report has been filed in by the Counter-Terrorism Department (CTD). Law enforcement personnel have also launched a search operation in the city. 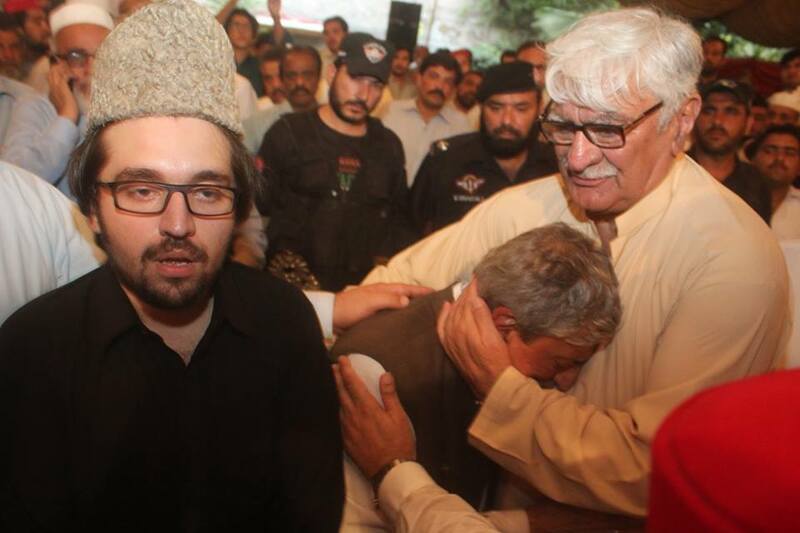 ANP chief Asfandyar Wali, while speaking to reporters today, said that the party would observe three days of peaceful mourning, adding that the ANP would participate in the polls, come what may. He expressed his anger and anguish over the situation and said that he has asked his party workers to remain calm, but that being backed into a corner may be a catalyst for unrest. "It will not be a good sign for the country if party workers shun the policy of patience," he said. The ANP leader explained that the party is facing a complex situation, where the enemy can identify them but they are unable to identify their enemies. "We cannot declare every man with a beard to be a member of the Taliban," he said. In 2012, Haroon Bilour's father Bashir Ahmed Bilour was also killed when a Pakistani Taliban bomber blew himself up in a party meeting in Peshawar. Last edited by MenInG; 11th July 2018 at 14:52. Pakistan Tehreek-e-Insaf announced to halt its political activities in Khyber Pakhtunkhwa for one day to show solidarity with Awami National Party. ANP leader Haroon Bilour among 20 others were killed in a suicide explosion in Peshawar's Yakatoot neighbourhood late Tuesday night. Later, the party even announced to postpone its rally in Peshawar scheduled for July 14 (Saturday). "Entire country is in mourning after the suicide explosion," according to a statement released by PTI. "We have postponed all electoral activities in KP for today (Wednesday)," remarked Fawad Chaudhry. Haroon Bilour, who was set to contest the July 25 elections from Peshawar's PK-78 constituency, will be buried in Wazir Bagh at 5pm today (Wednesday). A case over the incident has been registered at police station Agha Mir Jani Shah with SHO Wajid Ali as the complainant. It's a bad thing during election campaign. I remember in last General election His father was martyred in a blast. What is our army and intelligence doing? They are working behind the scene, god knows how many attacks they have prevented. Every single attack is an intelligence failure which would have huge repercussions in any part of the world. But sadly, we have become indifferent to the loss of human lives. PESHAWAR: Haroon Bilour's wife Thursday announced contesting the forthcoming election from PK-78 Peshawar, the same constituency her husband had also been contesting the polls from. Haroon was among 20 other martyrs after a suicide bomber detonated himself at a corner meeting of Awami National Party (ANP) in Peshawar late Tuesday. Two of 65 injured of the attack succumbed to their wounds earlier today, taking the death toll to 22. Haroon was son of Bashir Ahmed Bilour, a senior ANP figure who, himself, was martyred in a suicide blast back in 2012. Speaking to Geo News, Haroon's son confirmed that his mother would be contesting the election from his father's constituency PK-78 Peshawar. "Our morale is high," said Danial Bilour. Earlier on Thursday, Prime Minister Nasirul Mulk and Chief of Army Staff (COAS) General Qamar Javed Bajwa visited Peshawar and offered condolences to Bilour family. According to the army's media wing, the army chief, while talking to the family members, said “[the] Bilour family has stood firm in [the] war against terrorism with great sacrifices during [the] national effort. We have come a long way in our challenging journey to peace and [the] destination isn’t far Inshallah”. The prime minister also met the Bilour family at their residence and offered condolences. In honor of his sacrifice, PTI should not have a candidate against his wife. There are reports PTI is going to withdraw their candidate in favor of Haroon Bilour's wife from this seat to show their respect. PESHAWAR: The Awami National Party (ANP) has decided to nominate Samar Bilour, the widow of former party leader Haroon Bilour, to contest elections for the provincial assembly seat PK-78 Peshawar. Opposition parties have also decided to throw their weight behind her for the upcoming polls. Elections on the constituency had been postponed by the apex poll body after a suicide bomber targeted her husband — a candidate for the seat — on July 11 just as he left a corner meeting in the Yakatoot area of the city. The attack killed Haroon among 22 others and left over 60 people injured. The Election Commission of Pakistan (ECP) had scheduled for October 14 by-elections on seats which were vacated by successful parliamentarians who had won on multiple seats or for seats where elections had been postponed or where the results had been cancelled. The decision was taken by the parliamentary board of the Awami National Party (ANP) which met at the Bacha Khan Markaz, the party’s secretariat in Peshawar. ANP’s Deputy General Secretary Aimal Wali Khan, Syed Shahid Raza, Sardar Hussain Babak, attended the meeting. During the meeting, ANP also announced candidates for five more constituencies across the province where by-elections will be held. Waqar Ahmad Khan has been nominated to contest PK-7 in Swat, Ghulam Hasan for PK-44 in Swabi, Ahmad Bahadur for PK-53 in Mardan, Pervez Ahmad Khan for PK-61 in Nowshera, and Shahid Khattak for PK-64 in Nowshera. Later on Tuesday, nomination papers for Samar were collected by her family from the district election commissioner’s office. District Election Commissioner Abdul Qadir said that so far only one candidate had collected nomination papers and that no new candidate had appeared on the first day of filing papers. Qadir further said that before being postponed, 17 candidates had submitted their papers for PK-78. As per the rules, those who have previously submitted their nomination papers and were included in the final list of candidates are not required to re-submit their papers. However, if a candidate wishes to withdraw from the elections, this was the time to do so. While Samar is new to politics, her family has strong roots in the political history of the country. Apart from being the wife of late Haroon Bilour — the son of ANP stalwart Bashir Bilour — she is the daughter of former Sindh provincial minister Irfanullah Khan Marwat and granddaughter of former Pakistan president Ghulam Ishaq Khan. With Haroon’s son Daniyal just 16-years-old, he is ineligible to contest the elections. Hence, Samar has decided to carry her family’s banner in the upcoming by-polls. “She will take the mission of Bilour family ahead,” said Ghulam Ahmad Bilour, the central leader of ANP and Haroon’s paternal uncle. “The Bilour family has rendered tremendous sacrifices for peace and democracy in the country,” Ghulam said. The ANP urged all other candidates in the running for PK-78 to withdraw to defeat the enemies of democracy. All the opposition parties in the Khyber-Pakhtunkhwa (K-P) assembly have announced that they will support Samar in the PK-78 by-elections. The joint opposition held a meeting with ANP’s leadership on Tuesday after which they held a presser in which they announced that political parties in the joint opposition, including the Muttahida Majlis-e-Amal (MMA), Pakistan Muslim League-Nawaz (PML-N), and Qaumi Watan Party (QWP) will not field any candidates on PK-78. “We will decide about the rest of the seats in by-elections on party position. We are in contact with the opposition parties regarding the by-elections and we are receiving a positive response,” said ANP leader Mian Iftikhar Hussain. He added that the opposition parties will need to unite for democracy. He also urged the Pakistan Peoples Party (PPP) to withdraw its presidential candidate, Aitzaz Ahsan, in favour of Jamiat Ulema-e-Islam-Fazl (JUI-F) Chief Maulana Fazlur Rehman. “We are not in a minority if we are united,” he stated. Pakistan Muslim League-Nawaz (PML-N) Provincial President Amir Muqam requested all the parties to support Samar in the upcoming by-elections and elect her unopposed. “The Bilour family has rendered sacrifices and this act of political parties will give a positive message,” he said. Muttahida Majlis-e-Amal’s (MMA) Akram Khan Durrani, who is a former chief minister of the province, said that the decision to drop candidates in favour of Haroon Bilour’s widow was taken as per the traditions of the province. Meanwhile, the PPP also decided to withdraw its candidate for PK-78. Ghulam announced that PPP leader Farhatullah Babar had conveyed to him via PPP’s provincial president Zulfiqar Afghani that the party will not contest PK-78 in the upcoming by-polls and that their candidate will withdraw his nomination papers. “This decision of the PPP is a slap on the face of the enemies of humanity, democracy, and politics,” Ghulam said while expressing his gratitude to the PPP leadership. Hope ANP wins this seat. ANP has given most sacrifices in War on Terror especially Bilour family. ANP is a secular progressive party along with MQM and they must be part of the system. PTM is a good addition in Pak Politics. Guys like Asfand Yar Wali, Afrasiab Khattak, Bushra Gohar & Mian Iftikhar Hussain should be member of Parliament. It’s good for federation even if they are in Opposition. ANP & MQM will revive once again when State stops treating them like Step Children. So you want the old MQM? MQM is already part of the system and have 2 ministers. Pakistan is not just ANY part of the world. We share a border with blood-thirsty India on the right and terrorist-crippled Afghanistan on the left. Its a nightmare scenario for the intelligence yet they are among the best in the world because God knows how many times they've saved us from horrifying attacks.